Illuminate your decor with this transitional antique soft silver and crystal chandelier from the Vienna Full Spectrum collection of pendants. Featuring a transitional design with contemporary crystal shapes and curved metal frame, this breathtaking chandelier is an exquisite addition to any space. Refracted light bounces everywhere after striking this chandelier's jewelry-like configuration. 28 1/2" high x 22" wide. Canopy is 5 1/2" wide. Weighs 22 lbs. Includes 6-feet of chain. 12-feet of cord. Six maximum 60 watt or equivalent bulbs (not included). 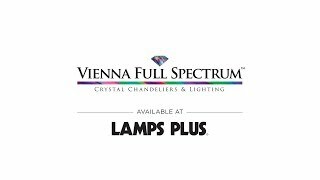 Stella six-light chandelier by Vienna Full Spectrum. Antique soft silver finish metal; crystal glass accents. Price was great. Size was what I wanted. Difficult to find correct width of light at right price. Hi, Would this beautiful chandelier work in a french country kitchen decor? BEST ANSWER: It IS truly beautiful! It adds a touch of contemporary with the clean lines and prisms instead of many-faceted crystals and lots of curlicues. I used it as a way to update my dining room with pale colors in the oushak rug that I used for inspiration. It replaced a brass chandelier and the look is stunning. I have combined it with very traditional mahogany federalist style antique furniture. I've never done a room in French country although I could see this chandelier used with the softer French country colors. I'm sure there are professional decorators out there that would tell you that it would be fine. One caution: it is heavy at 22 pounds! My electrician had to add the reinforcing bar that is normally used when hanging a ceiling fan. Also there are 78 crystal prisms that must be hung in the holes around the edge of the metal frame. The holes are small and the hooks on the prisms are small. Reserve some time and patience! Would this work with hue smart bulbs? What size? BEST ANSWER: Hi - I do not see why not as long as it is a candelabra base bulb. I am using candelabra bulbs, with an E12 base. Do you sale it with a bigger canopy.? BEST ANSWER: Hi - I am sorry, there are no other canopy options offered. Would this go in a master bedroom? BEST ANSWER: I think it could be used in a master bedroom. Does this lite go with champagne gold accents since it is called soft silver? BEST ANSWER: I would say "yes" - as we have different level of gold accents in our home/dining room and this looks so beautiful! Everyone compliments the light as we have the matching floor stand lamp in our living room as well! it has 'gold' highlights in the overall finish. Oh definitely YES. My sister is a gold girl and has it in her entry and dining room with a large ornate gold framed mirror. You will not be disappointed in your purchase. Just beautiful. It does have some hints of gold. As long as the champagne gold was also soft and not right next to the light I believe it will all blend. The light is gorgeous! Yes, it is similar to an antique finish with modern design. The soft brush finish has hints of gold. I agree with Jeanne B. In one of the reviews they mentioned they also bought the smaller sister model. Which would this model be? Can I please see a pic of this in a two story entryway? BEST ANSWER: Hi Scarlet - unfortunately, we do not have pictures available hanging in a two story entryway. But, if you use our "View in Your Room" feature on our website, you can see it hanging in your own home. Just click on the "View in your room" button on our website which is located just below the picture of the lamp to get started. Hi there! I have 8 foot ceiling in my formal dining room. What is the shortest this can be hung? BEST ANSWER: Hi Scarlet - you may use at least 1-link of hanging chain. Hmmm, I do not the answer to that question. I have hung this beautiful chandelier in my entry which has st least 20ft ceilings. Sorry. I used 6 links for my 8-foot ceiling. This brings the chandelier to 30 inches above the dining table. Does this chandelier “Stella” come in oiled bronze? Hi - I am sorry, the Stella Collection is not offered in any other finishes. is this too large to go over a roman tub? BEST ANSWER: It would depend on the size of the room and the height of the ceiling. I purchased it to go in a two-story entry and it looks beautiful. It's even more beautiful when seen through the window from the street. I was discouraged from this choice by the sales person who thought it might be too small for an entry, but I really wanted this finish, so tried it anyway and it worked. If your space is large enough and the ceiling is tall enough, I would try it - because it is really, really gorgeous. Hope that helps. It's a beautiful light but a little on the large side for over a tub. If you have the ceiling height it may work. It is quality and beautiful -has a slight gold glow to it. Not only providing excellent lighting but also excellent decorating of our high ceiling. Purchased this for our formal dining room and we absolutely love it! Easy to hang, except for adding the crystals which took a bit of time. However, it is perfect with our new furniture! Nice quality and very pleased with the reflection off our ceiling. All in all, another excellent piece from Lamps Plus! We picked up the light from the store. We also ordered it's sister light, smaller, and it is taking 4 months to get it....looking forward to getting it in Jan '16. Love this chandelier!! The crystals were very easy to install. I highly recommend this chandelier for any dining room with dimmable LEDs. Delivered to Canadian border as requested, all in good shape when picked up..free shipping to that point. Shipping to Canadian address is cost prohibitive..too bad! Cons: Time consuming to put together. I love them , I purchase two of them. 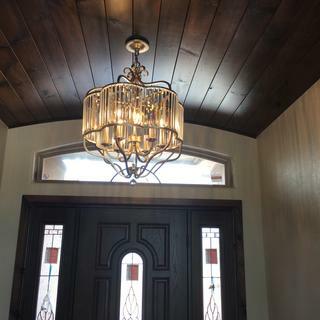 Purchased this to replace a 12 year chandelier that did not produce enough light and "wow" what a beautiful transformation this chandelier made in our dining room! Used the LED lights it came with, put in a LED dimmer and the glow, and light (sparkles on wall and ceiling) just beautiful! We also purchased the standing lamp in the same design for our downstairs - perfect! Another great purchase from Lamps Plus!